Rocket Monkeys are going to win the race, but without your help this will be impossible. Show some skills mate! 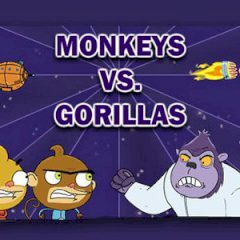 Rocket Monkeys are going to win some space races, but their opponents are gorillas. Well, this means there will be a lot of tricks and cheats. But you are ready, don't you?